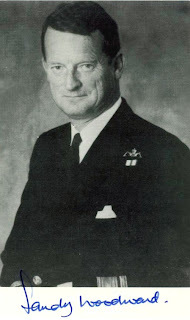 Sir John Forster "Sandy" Woodward is a British Admiral who joined the Royal Navy in 1946 at age thirteen. 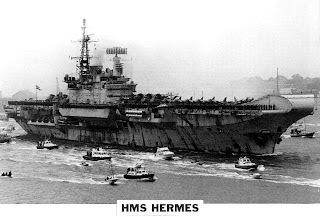 He became a submariner, and received his first command, the Valiant-class nuclear hunter-killer submarine Warspite in 1969. In 1978 he was appointed to the Ministry of Defence. Woodward was promoted to Rear Admiral and in 1981 appointed Flag Officer First Flotilla. In 1982 he commanded the South Atlantic Task Groups in the Falklands War under the Commander-in-Chief Lord Fieldhouse. For his efforts during the war Woodward was knighted. In 1983 Woodward was appointed Flag Officer Submarines and NATO Commander Submarines Eastern Atlantic. In 1984 he was promoted to Vice Admiral, and in 1985 he was a Deputy Chief of the Defence Staff. Before retirement in 1989 he also served as C in C Naval Home Command and Flag Aide-de-Camp to the Queen.